An English Homestead: Wow - What A Morning! Today was the first day back at school after the Easter holidays. That means that my wife is back at work and I'm back looking after the children, whilst I've still got some ewes to lamb. So Sunday night I went out to check the sheep that weer still to lamb just before bed time. There was a ewe struggling to lamb so I managed, after much running around, to catch her and get her into a pen I'd made in the field. This ewe was not easy to lamb, it was a single and the size of a small Labrador, I really struggle to get him out but managed in the end (the difficulty lies in pulling the lamb out and hold the ewe down on your own). I then moved her off to the shed to a bonding pen and went to bed around 11.30. My younger daughter then woke me up at 2.30 and I decided that whilst I was awake I might as well go and check them (I had considered not checking them that night as I have so few left to lamb). When I went out there one ewe had had a triple (no one want triples) and the lambs had wondered away from her as she was going a little crazy not being able to find them. I gathered them up and put them in the shed as well, then back to bed. I had my alarm set for six but with three young children there is little need for an alarm in our house! I got up quickly (for me), I wanted to check on the lambs born the night before and do my other jobs. When I went to check on the expectant ewes there was one lambing - damn I thought (or maybe something stronger). I could do without that during the school run. I managed to pen her up (again with much running around) and I had a "bit of an inspection" unfortunately she wasn't far enough on with her lambing and her cervix hadn't opened up fully. So I then sorted out the sheep in the shed, did the green houses, uncovered certain garden crops, fed the chickens and then went inside to see my wife off and sort the kids out, make their lunch boxes, get forest school kit ready etc, give them breakfast, clean teeth and get them dress. 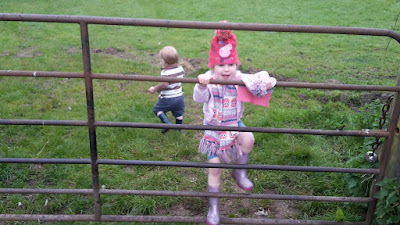 I managed all that done by eight o'clock (we normally leave by 8.30 to get there with plenty of time to spare) so I got the kids to get their wellies on and marched them all down the field. The girls were told to look after the boy and make sure he didn't wonder off whilst I set about lambing this ewe. The kids were utterly transfixed as I put my hand inside her and after much effort managed to pull out two live lambs in front of their very eyes, my younger daughter told me there and then that she wanted to be a farmer (and a carpenter)! 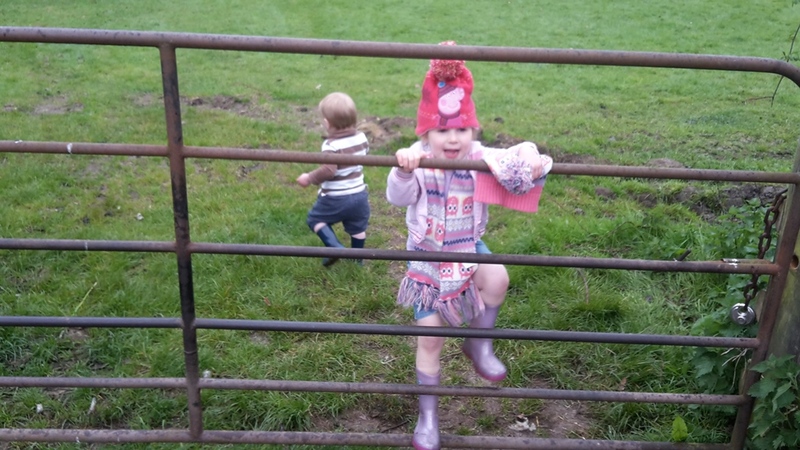 Then with time against me I managed to get the sheep and lambs up to the shed (as it was raining), round up the children, get them in the car, change out of my overalls (and then clothes when I realised it had soaked through) and drive them to school. The road was then blocked so we had to turn round and go a longer way to school. We got there just as the gate was closing, but to be honest in my mind what they saw and experienced in that hour this morning would be far better than what they'd see or do at school, so if they were late I wouldn't have been very bothered! With the eldest dropped at school, the middle one then got dropped off at preschool and the youngest and me then went to the community church in the village where I volunteer at a playgroup to get set up for the mornings session! In all it was quiet a full on morning! It's funny I've always said I want to give my children a similar childhood to my own and I think I was doing just that this morning! Wow you are one amazing man. I'm exhausted just reading this Kev. Well done and what a great education for the kids. Wow. I haven't gotten that much done all day! Hang in there! What a great morning. Is this the first time your children have seen lambs born? Jeeeze; I have a busy life, but you win the prize! I echo the thought about feeling exhausted reading your post. And I've only just woken up! I think you are right about the value in the time you spend with your children. And for the rest of the day?????? Your children are having a wonderful time, enjoy. Wonderful! Isn't it great when the kids learn by doing and not by TV!